Every student learns at a different pace, and when it comes to retaining new information, research shows that self-testing with small, bite-sized chunks of information works best. 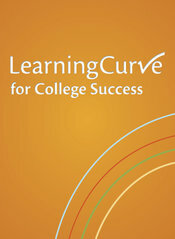 LearningCurve for College Success, an adaptive quizzing program from Bedford/St. Martin's, quickly learns what students already know and helps them practice what they don't yet understand. LearningCurve motivates students to engage with key concepts before they come to class so that they are ready to participate, and reporting tools help teachers discern their students' needs. With LearningCurve, students receive as much practice as they need to master a given concept and are provided with immediate feedback and links back to online instruction. A personalized study plan with suggestions for further practice completes Bedford's plan to give your students just what they need to thrive in the college success course, in their college career, and beyond!